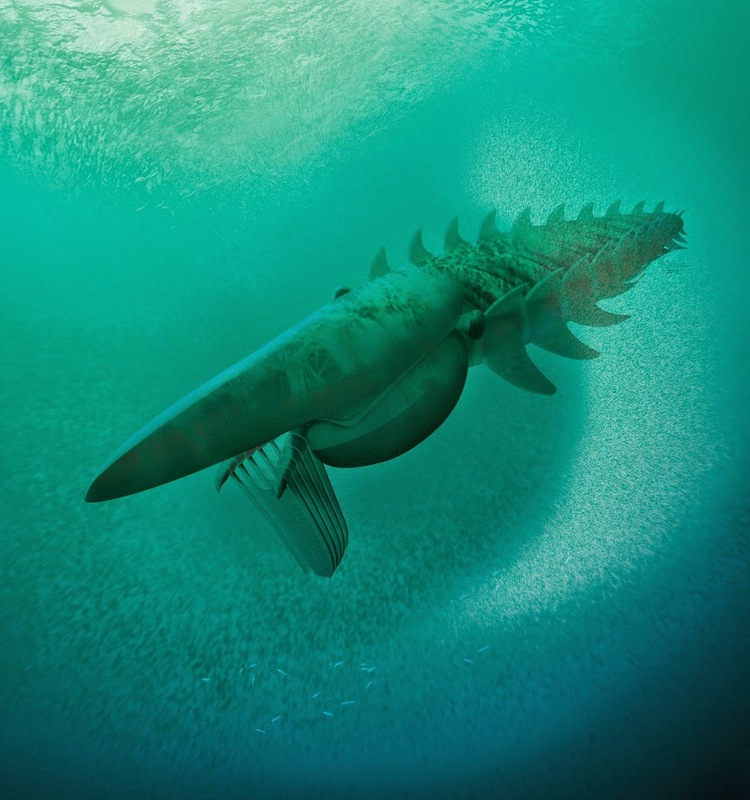 Reconstruction of the giant filter-feeding anomalocaridid Aegirocassis benmoulae from the Early Ordovician (ca 480 million years old) of Morocco feeding on a plankton cloud. 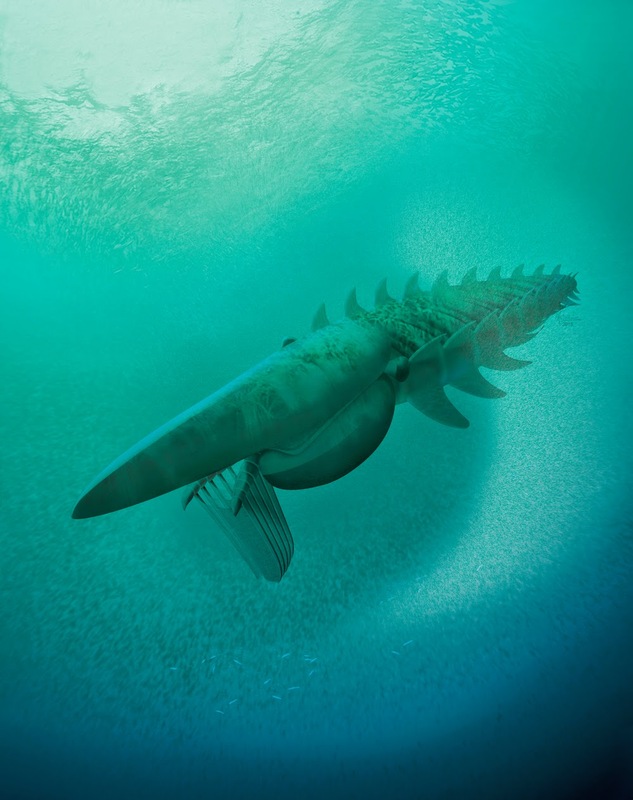 Aegirocassis reached a length in excess of 2 m, making it one of the biggest arthropods to have ever lived, and foreshadows the appearance much later of giant filter-feeding sharks and whales. Exceptionally preserved fossils from the Palaeozoic era provide crucial insights into arthropod evolution, with recent discoveries bringing phylogeny and character homology into sharp focus. Integral to such studies are anomalocaridids, a clade of stem arthropods whose remarkable morphology illuminates early arthropod relationships and Cambrian ecology. 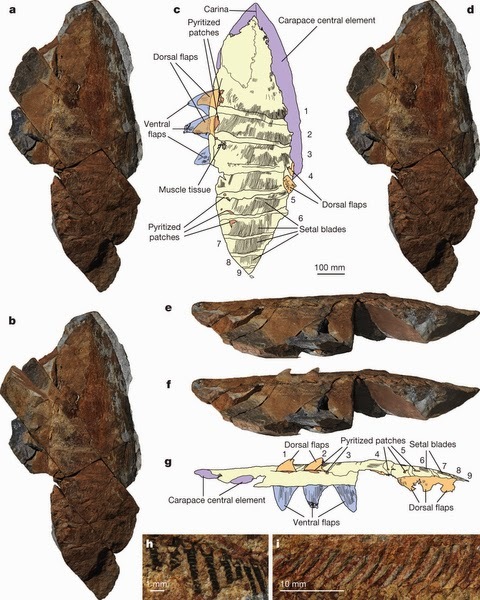 Although recent work has focused on the anomalocaridid head, the nature of their trunk has been debated widely. 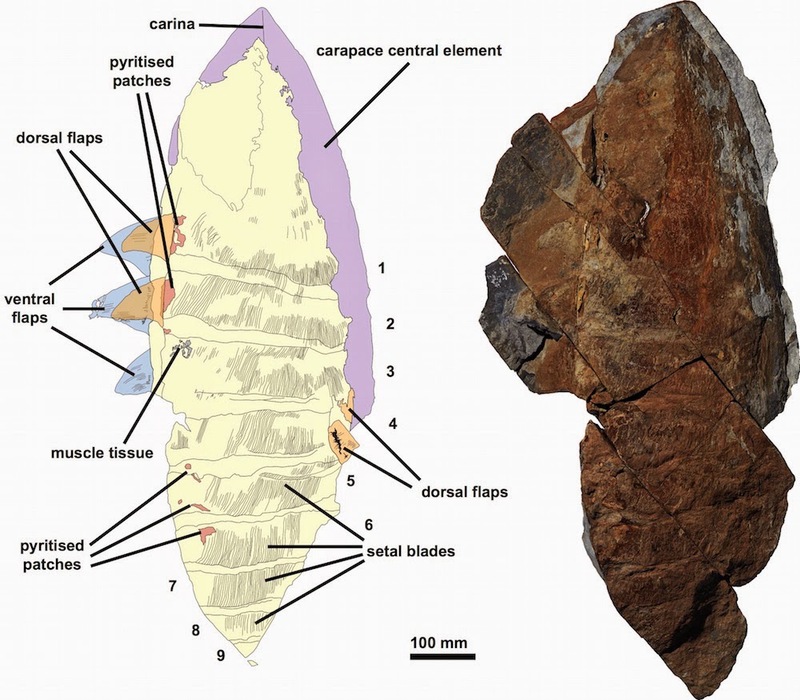 Here we describe new anomalocaridid specimens from the Early Ordovician Fezouata Biota of Morocco, which not only show well-preserved head appendages providing key ecological data, but also elucidate the nature of anomalocaridid trunk flaps, resolving their homology with arthropod trunk limbs. The new material shows that each trunk segment bears a separate dorsal and ventral pair of flaps, with a series of setal blades attached at the base of the dorsal flaps. Comparisons with other stem lineage arthropods indicate that anomalocaridid ventral flaps are homologous with lobopodous walking limbs and the endopod of the euarthropod biramous limb, whereas the dorsal flaps and associated setal blades are homologous with the flaps of gilled lobopodians (for example, Kerygmachela kierkegaardi, Pambdelurion whittingtoni) and exites of the ‘Cambrian biramous limb’. This evidence shows that anomalocaridids represent a stage before the fusion of exite and endopod into the ‘Cambrian biramous limb, confirming their basal placement in the euarthropod stem, rather than in the arthropod crown or with cycloneuralian worms. Unlike other anomalocaridids, the Fezouata taxon combines head appendages convergently adapted for filter-feeding with an unprecedented body length exceeding 2 m, indicating a new direction in the feeding ecology of the clade. The evolution of giant filter-feeding anomalocaridids may reflect the establishment of highly developed planktic ecosystems during the Great Ordovician Biodiversification Event. A dorsal view of the fossil alongside a drawing of the specimen. Note the double set of lateral flaps, a discovery that researchers overlooked in previous anomalocaridid fossils. Aegirocassis benmoulae gen. et sp. nov.
Etymology. Ægir: a giant in Norse mythology and god of the sea; cassis (Latin, helmet): referring to the huge size and elaborate cephalic shield; and in recognition of Mohamed ‘Ou Said’ Ben Moula, who discovered the Fezouata Biota and the specimens described here. Gender feminine. Figure 1: Aegirocassis benmoulae, holotype YPM 237172, Early Ordovician, Fezouata Biota, Morocco. a–d, Dorsal view: a, part, showing ventral flaps; b, part, separate block in place, showing dorsal flaps; c, interpretative drawing combining part and counterpart; d, part, matrix surrounding dorsal flaps digitally removed to show both sets of flaps. e–g, Lateral view: e, part; f, part, dorsal flaps added from counterpart; g, interpretative drawing combining part and counterpart. h, Part, transverse rods composed of hollow cones of third ventral flap. i, Counterpart, oblique view of anterior free end of setal blades showing lamellae laterally. Arabic numerals indicate trunk somites. Peter Van Roy, Allison C. Daley and Derek E. G. Briggs. 2015. Anomalocaridid Trunk Limb Homology revealed by A Giant Filter-feeder with paired Flaps.